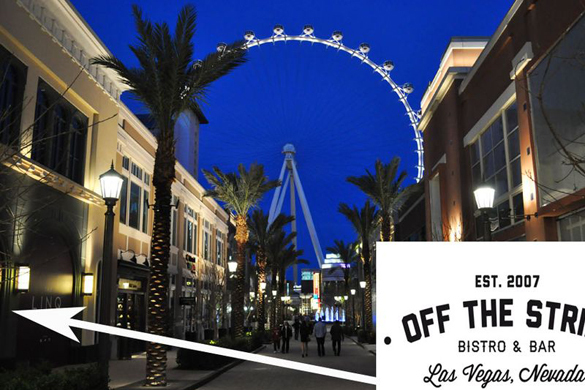 Off The Strip is a Las Vegas locals’ favourite which boasts classic hearty favourites, served quickly, in a beautifully presented bistro style. This cool & elegant hang-out is located amidst the excitement of The Linq in the shadow of the incredible High Roller, in the centre of the Strip. This two-story restaurant features three bars as well as indoor and outdoor dining. The service is warm, friendly, relaxed and unpretentious. This eatery will suit casual diners who want high end popular food & craft beers. Open 24 hours a day, Off The Strip was founded in 2007 by brothers Tom Goldsbury and the late Chef Al Hubbard. They wanted to create a local hideaway that served above-average, Strip-quality cuisine. They’ve achieved their goal. 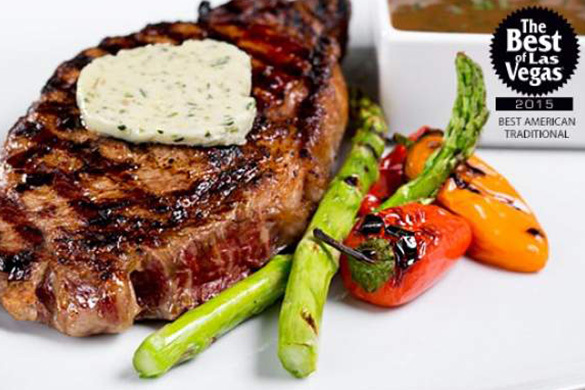 From steaks, chops, seafood to authentic pasta dishes, they do it all…and they do it very well! The appetisers are a great start to the meal, in fact I could eat these an entire meal! I was recommended the ‘NY Strip Wrapped Asparagus’ – a new one on me! What this dish lacks in appearance it certainly makes up for in flavour. The texture, flavour & tenderness of the steak was a delight. The sauce was perfect without being overwhelming. Enough for 2-3 to share! I couldn’t resist the ‘giant meatball’ which was Chef Al’s signature appetiser. This 10oz handmade gem is covered in the signature sauce. A delight and a meal in itself. The perfect tender meatball – bravo! Finally the sweet chili & bacon prawns were a beautifully refreshing start to any meal. With a little kick, these fresh shrimp were lovely!…. One of my favourite dishes on earth is the eggplant parmesan. So does Off The Strip’s version live up to expectations? Indeed they do! One of the best examples of this sensational Italian work of art that I’ve tasted. I would return to Off The Strip just for this! Off The Strip pride themselves on the ‘fish of the day’. Today is the grouper fish, fresh out of Florida. Served with carrot skordalia, sautéed cabbage and roasted grapes – divine! The fish was cooked perfectly. Sides & Salads at Off The Strip are lovely. Do try the ‘Garbage Ensalata’ is a meal in itself. I know it doesn’t sound great but it does have ‘everything’ in it…. With fresh greens, shrimp, salami, capers & cherry tomatoes topped with blue cheese – I loved it! The Truffle Parmesan Fries are a Vegas must. So decadent and indulgent & the epitome of a Sin City side. I know American’s don’t necessarily like ‘green stuff’ but the seasonal vegetables go wonderfully with the lamb especially. Desserts are a must at Off The Strip! The chocolate lava cake was divine. So packed with flavour, moist and served with ice-cream and strawberry sauce. The perfect crescendo to this meal. The cheesecake was again as good as it gets. Perfect size for sharing. Finally the crème brulee was a rare delight. Done correctly this is the perfect finale to any meal – this was. Just gorgeous. This is a delightful experience. Great food and wonderful service. I can’t wait to return to Off The Strip at the Linq. Review by Alex Belfield for Celebrity Radio 24th May 2016. … My friends ordered a protein burger and a regular burger and i can tell you those meat patties are huge! the moscow mule was really good and well made. “Stopped in after looking at other options in the new promenade area- settled on this after looking at the menu. Great service … Definitely recommend the chicken avocado and waffle fries … Overall a nice spot for lunch! “Came in with group. We came in for dinner and helped to a table fairly quick. Restaurant is a bit dark even with the lights at the table. Modern. The lengthy cocktail menu boasts fun names for its creative creations. Enjoy bottomless breakfast cocktails for $60 with the purchase of weekend brunch.